Photos used in this blog entry were taken by Thomas. If you click on their website, you’ll see that Straits also has a location in San Francisco, in Atlanta, and in San Jose. 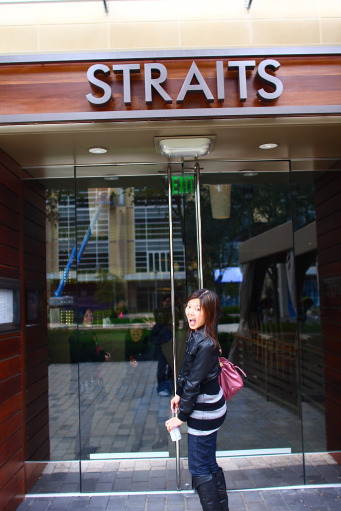 I’ve been to Straits before for drinks but have never thought to try their restaurant. Willis, a Houston foodie, recommended that we tried Straits because everything he’s had there he’s enjoyed. 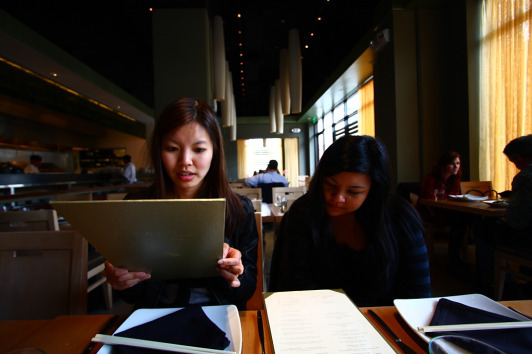 Specializing in Asian fusion, the restaurant certainly has a trendy and modern flair in both their cuisine and their atmosphere. Our group of four ordered the Roti Prata, a pulled duck sandwich, and Indian street noodles. 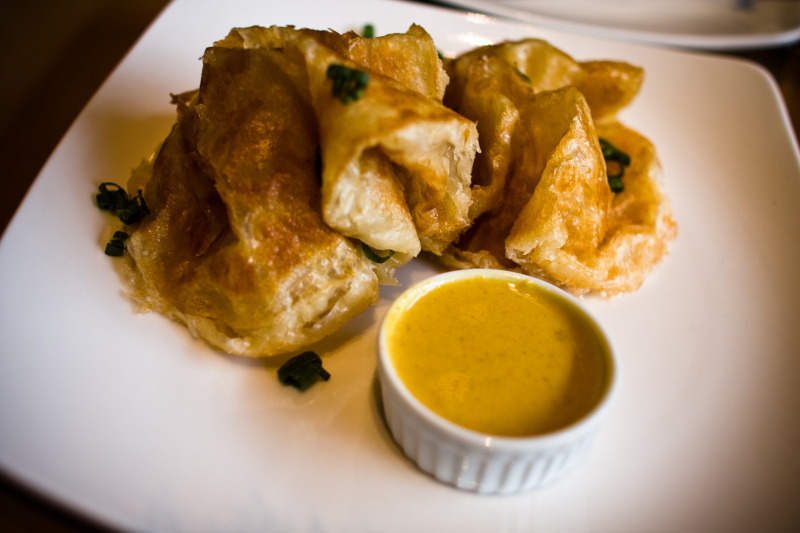 Roti is a crisp griddled Indian Flatbread. It came with the a curry dipping sauce. My three eating buddies LOVED it. I thought it was good. It’s like eating puff pastry with a delicious dip and really, that’s hard to go wrong with. I like my carbs. 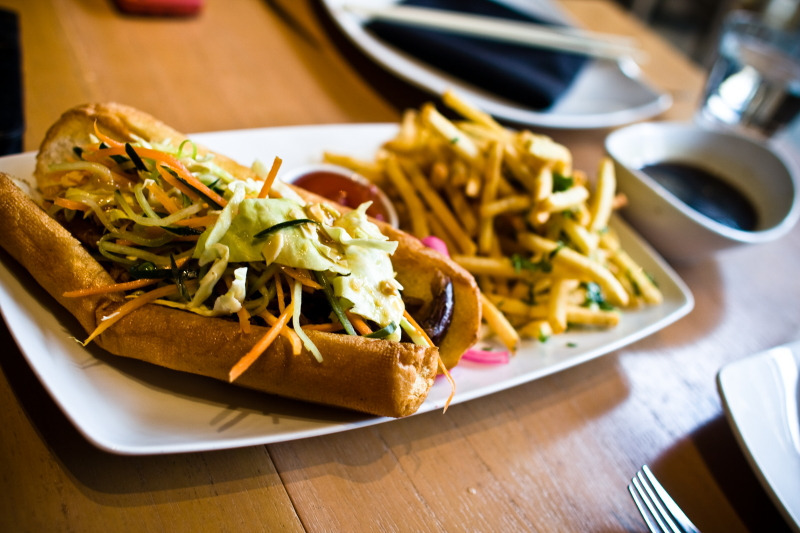 Pictured above is the slow roasted pulled duck sandwich that comes with a dipping sauce. Seriously, out of all the dishes we’ve tried that day (I’m also including a dinner that is not included in this lunch), if I could only have one thing over again it will be this pulled duck sandwich. It was heavenly. The Asian Slaw and Shiitake Au Jus with the pulled tender hearty duck, dipped into that sauce was such a powerful fusion. You could taste everything! All the flavors and textures contrasted in such a harmonious way that it’s STUNNING. I’m not kidding when I say of all the delicious food I had that day, if I could only have a repeat of one, it’ll be this sandwich. The fries, dusted with garlic and Parmesan, were a nice complement. fried with cabbage, tofu, prawns, tomatoes. This was pretty decent. It sounds perfect after a night out drinking. I guess it was overshadowed by the fabulous pulled duck sandwich. The prawns and tomatoes were especially satisfying. One quality I realize I cherish in my friends is their ability to have fun (almost shamelessly). Thomas left us girls to use the bathroom and came back reporting that the bathroom was “awesome.” So we three girls left Thomas to check it out. 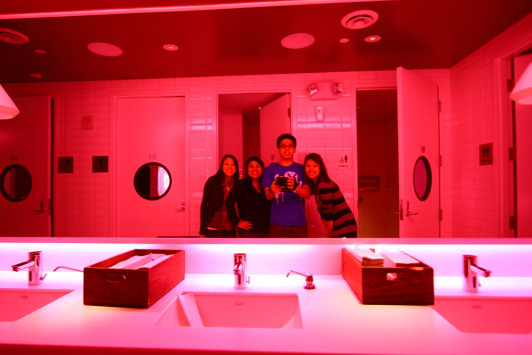 To our utter childlike amusement, we were delighted that in addition to the hot pink lighting, the bathroom was also a UNISEX. Party in the bathroom! So we came back and fetched our boy, Thomas and proceeded to have a photo shoot. 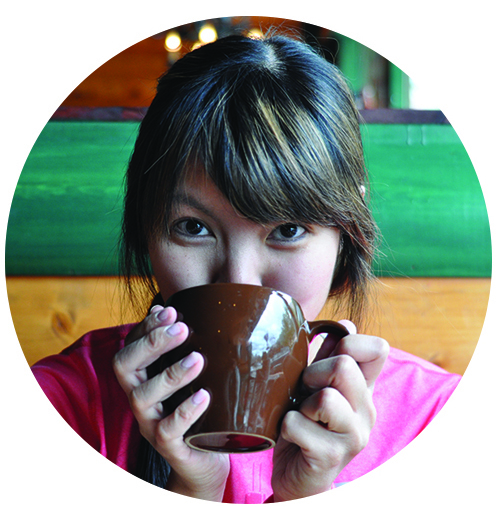 Next up and last for this progressive series, dessert at Juicebox!